The Toyota FT-1 concept is a pure performance, track-focused sports car model created by CALTY Design Research, Toyota’s North American Design branch. The FT-1 concept is a symbol that captures elements of the emotion and energy we can expect to see in future Toyota vehicles designs. Its design is heavily influenced by Toyota’s long sports car tradition that includes vehicles such as 2000GT, Celica, Supra and most recently, FT-86 (Scion F-RS). 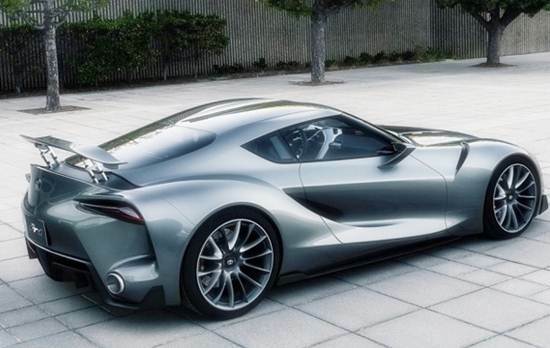 The long-expected 2017 Toyota FT-1 super car comes as the ultimate in car design. The FT stands for “Future Toyota,” and the number “1” represents the non plus ultra that according to Toyota the model will be. Although no further details were released yet, the FT-1 could be powered by a 2.5-litre turbocharged V6, or V8, hybrid powertrain producing up to 450 horsepower and 480 lb-ft of torque.